Think about how long it took to complete all of that paperwork. How many think they arrived at the answer yesterday and took this morning just to do the paperwork? 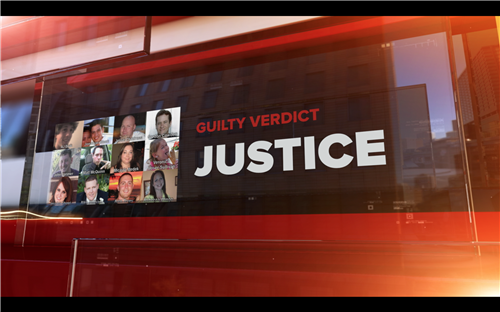 All jurors have confirmed they agree with the verdicts. @Imnotreallyhere: 'Totally agree with you. See my comment below a few lines. Manipulative, YES. INSANE-'NO. Insane folks don't label themselves as "disorganized in thinking", etc. That was straight from his mental illness research. He may deserve an Oscar for his actions and attempts at manipulating many professionals. He does NOT deserve mercy due to "insanity". It just is pure manufacturing of symptoms, after RESEARCHING MENTAL ILLNESS, per his own notes. Can't believe an hour has already passed. Hi Tammy Garrison, glad you made it! Spengler to Holmes: "Are you okay"
Keep in mind people, there is a difference between being "insane" and being "mentally ill." Yes, "insanity" in normal parlance is often used for those with mental issues, but being "insane" under the eyes of the law and thus being "not guilty by reason of insanity" requires proving that he had no idea what he was doing was wrong. No idea that it was illegal, and that this lack of knowledge was as the result of a psychotic issue. Considering the volume of evidence presented showing how he meticulously planned out the attack, his escape, and booby trapped his home, it is hard to argue that he did not know what he did was wrong. There are 165 counts total. The Prosecution is doing a great job being diplomatic --- I would've been high-fiving everyone. What was the purpose of King asking to poll the jury??? Remind us of count 141 and why part c was not marked. btw - part B ... They only complete this "B" form if the verdict is NOT GUILTY otherwise they have to leave this page blank. Congrats to the prosecution team, you did a very good job and came in very well prepared. The people of the State of Colorado thank you! I wouldn't want my life e in the hands of a jury. The jury got it right. Thank you George Brauchler and the Procecution for your hard work. God Bless the victims and their families. Any idea what is happening in the courtroom that everyone is turning and looking at? hxgal is right about legal insanity and mental illness. King tried to portray him as Not Guilty By Reason of Psychosis. #Jurors passed a box of tissue as #TheaterShooting verdict read. Some jurors looked at shooter. #NOW: Josh Nowlan who was shot and wounded in #theatershooting makes fist and cries as guilty verdicts read. @MamaRedfield comforts others.